To go in the realms of super macro, one has to address methods of adding magnification to a standard macro lens. This can be done in a multitude of ways, but in underwater photography, the most practical and frequent mean of doing so is to add a close up lens in front of the lens. This close up lens can be of internal or of external type, doing so internally limits the photographer range of subjects for the duration of the dive. To go in the realms of super macro, one has to address methods of adding magnification to a standard macro lens. This can be done in a multitude of ways, but in underwater photography, the most practical and frequent mean of doing so is to add a close up lens in front of the lens. This close up lens can be of internal or of external type, doing so internally limits the photographer range of subjects for the duration of the dive. By adding the close up lens (also called Wet Diopter) externally to the front of the macro port, the photographers benefits from the flexibility of moving from regular close up work to super macro as they wish during a dive. This Close-Up kit is a new addition to the Aquatica system, which is arguably one of the most comprehensive in the industry, consisting of a macro port lens holder with +5 and +10 diopters lenses, these are water contact diopters and are made from high-quality achromatic dual elements BK-7 mineral glass, each lenses is treated with both a scratch resistant and anti reflection coating for maximum protection and brightness. Optical performance is maintained to the highest standard, providing a very flat plane of focus which is virtually free of color fringing. The dual elements (commonly known as doublets) are sealed inside an air space. This optical formula helps eliminate aberration and distortion, improving sharpness and maintaining the magnification of the original lens when submerged. The Aquatica close lenses have true magnification value, when a close up lens is not air sealed, refraction will rob it of most of its magnification when immersed underwater. The Aquatica r +5 and +10 Close-Up lenses will retain their strength at all time. The doublet formula also guarantees improved performance over single element design. Super macro is within your reach, with the +10 offering as much as 2.2:1 magnification using a standard 105mm Macro lens. At twice life size, imagine the possibility of having a radical point of view on your subject, showing details so small that the human eye cannot resolve normally! 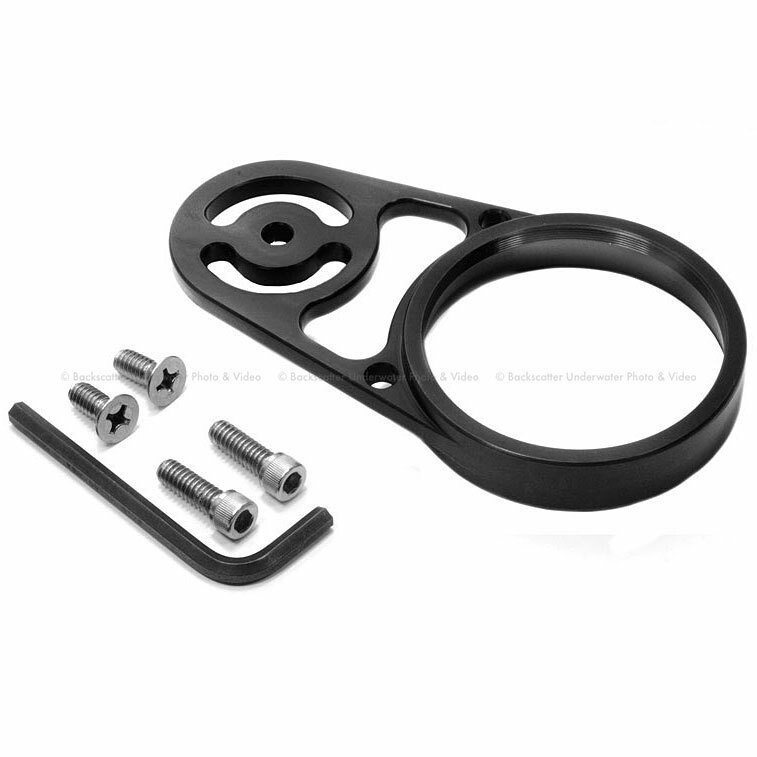 Our Close up lens holder will mount on any bayonet macro port ever made by Aquatica. It uses non aggressive fastener that will not scratch or damage the protective layer of anodizing on the port. Both the holder and lenses body are machined from the highest quality aluminum, every part is hand polished then anodized to military specifications, optic are assembled by hand and every single one critically inspected before leaving ours premises. Mounting the close up lens is done via a unique press fit method, this makes for a quick and secure mounting. Both the +5 and +10 close-up lenses also have a standard 67mm thread incorporated in their design for added versatility.